Not long ago there were a few thoughtful and thought-provoking threads on Corinne McKay's Thoughts on Translation blog that explored the issues of earnings and setting rates for language services. It started off with a thread on how much freelancers earn (with more than 80 comments to date! ), then after shots were traded between Chris Durban and others over the magic 40-cent-per-word milestone, a follow-up post carried the discussion further. Both of those and the discussion of volume discounts on the same blog are worth reading and considering for your situation. Except for the laziness of most wannabe translators in matters of research, one might think that this discussion would have died out ages ago except perhaps for strategic exchanges of information on how one might quote more appropriately in a particular market segment or for discussions of new developments like a real or imagined economic crisis and the opportunities it provides. The routine answers are, after all, available for anyone wiling to wade through a swamp of dis- and misinformation. There are basically three approaches to pricing levels: (1) determining sustenance levels by calculating expenses, available time and approximate productivity and hopefully not forgetting long-term needs like retirement savings and medical insurance where relevant, then setting rates accordingly; (2) herd pricing (charging what others charge more or less, or what you think they do); and (3) value pricing (what the market will bear). The first approach is one often recommended to beginners or those who are struggling to pay bills, perhaps despite a heavy workload. It is indeed a useful exercise to do the math: add up all your expenses, your anticipated need to save for the (un)certain future, and divide it all up by how many hours you expect to work to get an hourly rate. Divide that by your output, and you'll have a target piece rate for your slave labor below which you should not go lest hunger take you in its greedy jaws. For those lacking an overview of such matters, there are any number of useful guidelines for this available on the Internet; even ProZ offers a somewhat reasonable "rate calculator" for determining this baseline. It's useful to do these calculations from time to time as one's life circumstances change to ensure that the rates charged are at least sustainable; in highly competitive situations with price pressure, this may be essential. But ultimately I consider this a foolish, limiting approach that may either ignore opportunity or be totally irrelevant given the realities of a particular market. If you calculate a required target rate of ten cents per source word with your output and your 'niche' will expect you to charge three cents, it's time to change your game. Herd pricing seems to be the path most taken, possibly because it requires no math and often less thinking. "What do you charge?" is a frequent question among translation colleagues, and to the extent that it is honestly answered, it may provide some useful information. I prefer my answers of this sort pooled in some way, such as the BDÜ rate surveys, though with these I sorely miss information on standard deviations. How can I aspire to being a six-sigma translator when it comes to rates if I don't know what the standard deviation is? I like to know what my 'competitors' charge as much as the next guy or gal, but ultimately, this is really not what my pricing should be based on. From a proper running dog capitalist perspective, a 'fair rate' is what the market will bear. If, for the instructions shipped with an electric toaster, the market will bear a piece rate that translates to three euros per hour net earnings for me, then dems da breakz, I accept it, let that work go to Calcutta with a smile and move on. Given a recent chat I had with an agency owner and friend, there seems to be more of this, so much so that he described anyone willing to pay my rates for ordinary technical translation as simply 'clueless'. Maybe. I like to think of my customers as 'lawsuit averse' or 'marketing savvy' rather than clueless, but then the national motto where I come from isn't Geiz ist geil. Imagine that your client requires the translation of a project proposal overnight. The amount of work to be done is horrendous and requires a carefully coordinated, all-out, all-night effort by skilled specialists. Competitors in this RFP will most likely not be greatly differentiated in price or delivery times; in the end, if the decision doesn't rest on a bribe it may come down to naked persuasion, the psychology and semantics of the proposal itself. If successful, this bid will result in millions of euros in new business and strong, guaranteed growth for the next few years. Not bad, really. 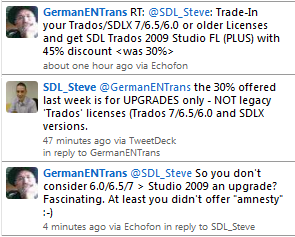 Someone intending to get a new SDL Trados license will indeed save significant money. AFAIK the package still includes the old SDL Trados 2007 Suite and SDLX. Even if you prefer other tools as I do, there may be a case for purchasing a new license of upgrading an old one for better workflows and QA in projects involving multiple tools. For example, memoQ translates SDLXLIFF files from Trados Studio quite nicely, but does not (in version 4.5.71), I believe, set the flag to indicate that the translated segments have been confirmed. That's a minor thing, but in general if a deliverable is called for in some other vendor's format like TXF (Star Transit), TTX (Trados TagEditor) or SDLXLIFF (Trados Studio), there are some advantages to doing final QA checks in those environments to avoid surprises. Even Kilgray, known for the high cost of memoQ in the opinion of some translators who prefer their CATs to be furry, not fuzzy, routinely offers ProZ group buy pricing and other special packages for significantly less than the 50% off rate now offered by SDL. I paid about 400 euros for my memoQ Pro license a while back, and typical special packages I've seen since then run between 300 and 400 euros. I disagree strongly with Renato's suggestion that "free" or at most $99 is the "right" price for a high-end commercial translation environment tool able to support work with dozens of media formats and work efficiently in collaborative environments, mine terminology and apply it for translation and QA, etc. Get real. We've been there and seen that approach (or something close to it) fail: Déjà Vu. Once my favorite tool, this once fine software from Atril has been horribly neglected for most of the past 8 years, with very few upgrades released to fix bugs or add new formats. Users were promised "free upgrades", and we got what we paid for. Frankly, I would have preferred paying a few hundred euros for a tool that helped me earn a comfortable living, so I could see it evolve and benefit from the innovations. I can understand the allergy than many developed to annual support fees through past bad experiences with SDL, but I have the impression that this is improving, and market leaders like Kilgray are legendary for their support and continual improvement of their software products, and such companies earn their support fees and our support as well. And let's not forget support. Someone like me, who has a serious geek streak, can live with the RTFM world of the free tools, where despite occasionally good user communities and some incredibly helpful individuals, you are (rightfully) pretty much on your own to sink or swim. One of the best reasons to invest in a commercial tool for modern, professional translation work, is to have your hand held when necessary by competent people in the UK, Hungary or elsewhere. I'm getting old and have a bad memory these days, but without thinking very hard I can come up with at least half a dozen incidents in the past year where an acquaintance of mine with less technical savvy than my dog has had projects rescued by the legendary Kilgray support department for memoQ. I've heard some similar tales for SDL, and I see very clearly the commitment of excellent employees in both these companies (and others) to making their users' experience more secure and beneficial. And that, my friends, is a part of the balance sheet where freeware and Open Source projects will never look as good. Yesterday I learned that my friend Oskar Kasperl had died last Sunday. He was a great translator and a very unique man. When I sat in his living room and looked at the rows of books he translated, including many of the most important teaching texts in the GDR for agriculture, veterinary science, dog training, hunting and other subjects I love, the thought in my mind was that if I could manage 20% of that in my remaining years I could look back on a very successful life as a translator. I first got to know him as the stubborn old man who walked with two crutches but kept his gardens immaculate, by himself, through sheer force of will. He reminded me of a favorite uncle who died over 20 years ago who, when crippled by arthritis so he could no longer bend over to tend his garden, brought his garden to his great height with boxed beds raised on high tables. Oskar was not one to let small matters like age, infirmity and pain beat him. When I got to know his daughter, who was trained as a translator and interpreter of English and Bengali, I had no idea the two were related. She and her husband sat with us often and told about "Oskar" and his wild life as a translator and hunter. He worked in a team with his wife, dictating as she typed at high speed. His output was enormous. His contributions to education and knowledge sharing did not go unappreciated at the highest level. Erich Honecker once gave him a wish to honor this contribution on a milestone birthday. The wish was to own a drilling, a traditional three-barreled hunting rifle. At the time, private possession of such weapons was virtually impossible except to the SED's most faithful - of which he was not one. The wish was granted. 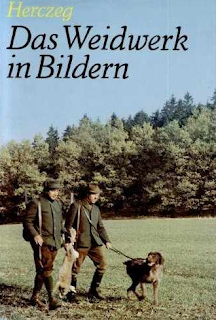 When he gave up his hunting license at age 88, the drilling passed to me somewhat to the amazement of the local police, who had granted special permission for him to keep that gun until the end of his life after he had given up the rest of his arms collection acquired after the German reunification. The gun itself is 30 years old; the scope on it is probably 15 years older than that. I have other, technically better rifles and scopes, but this one somehow shoots better than all the others as I have found time and again on the range and in the field. When I carry it, I feel a special connection to a friend and the traditions he cared so much about. Oskar made a difference in this world as a translator and a person. He was certainly no saint, and home life was often not peaceful. But his abiding love for his children was never in doubt, and this was obvious whenever his daughters spoke of him. I visited one tonight, and we sat for many hours in the kitchen eating Russian pancakes and garlic soup and drinking coffee, talking about him and his life and its many crazy tales. Perhaps some of these will be written down; perhaps the writings will be translated. I know just the illustrator for the tales. Her work reminds me of the best illustrations of Roald Dahl's stories, and Oskar's are often just as strange. When I was leaving, his daughter told me about a cache of old photographs she had discovered, which she had never seen before. She saw herself as a tiny baby held in the arms of a father radiant with pride and love. I know that feeling, and I know that light will never dim. Somewhere in the boxed detritus I haul around through my various moves is an old red notebook to remind me of the power of sleep. Its pages, witnessed by another chemist and a bioengineer, have the first description of a process for making a UV-blocking silicone crosslinker which was a critical ingredient for the first optically clear platinum-cured silicone for making intraocular lenses as replacements for the eye's natural lens when cataracts set in. The idea came to me as I woke up from a nap in a particularly boring lecture; the problem of optically clear, UV-blocking materials for injectable IOLs had kept a few research groups busy for a decade. When I realized that my Ph.D. adviser was more interested in publications than a patent that would earn millions, I gave the technology away to a friend. It did in fact make a lot of money for a number of people at STAAR Surgical Co., and in all the later years when I consulted there to keep that technology on track, very few knew where it had originally come from. I thought about that notebook a few days ago when I saw a tweet from Ed Gandia which led to an audio clip talking about the importance of sleep to the creative process. My own experience over more than four decades has affirmed this time and again. About a year after dreaming up the UV silicone, a friend asked me if there were any jigsaw puzzles for her 3-year-old to play on their Mac Plus. I told her "not as far as I know" and explained patiently that this would be a rather difficult problem, certainly beyond my abilities. At 3 am the next morning I woke up with all the code in my head, and an hour later the first working version of "HyperPuzzle" was created, which took pictures of animals, cut them up into a grid of tiles which were mixed up, rotated and reflected. I released it as shareware and made just enough money off it to "enjoy" a few meals at Wendy's, but I did get quite a thrill when I found out it was being used for stroke patient rehab at a clinic in Boston. Later, some of its modules were incorporated into the Voyager edition of Brian Thomas' virtual monastery library. It's actually rather common, not just with me, for sleep to be the critical element missing from a problem's solution. Problems of translation are no exception. So often I have stopped dead at the fortress walls of some three-quarter page abomination of a sentence in a German patent, attacked it on various flanks and retreated in disarray to my bed. The next morning, well rested, I notice that the gate in that wall was left unlocked and unattended, and I pass through to a coherent, accurate translation of the previously impenetrable sentence. I think that anyone reading this must have similar experiences, where the frontal assault on linguistic barricades is fruitless, but a little or a lot of R&R sweeps the obstacles aside. So why do we persist in doing the opposite of what our experience tells us is necessary for creative productivity? Par force translation is usually neither faster if accurate nor of better quality. Truly, the end justifies the sleep.